Don’t run above your pay grade: the (not so) hidden dangers of maximalist shoes. There is a segment of the running community that continues to insist that maximalist shoes are the way to go, and that minimalism is nothing but a “fad.” This insistence goes against every biomechanical and physical principle that I can think of. One of the ways in which maximalist shoes violate these mechanical principles is by having wide soles. This is incremental: the more maximalist, the greater the violation. When running in maximalist shoes, the impact forces incurred during the landing phase are much greater. Take for example the following picture, which shows the back of a shod and an unshod foot. When the foot is fully pronated at the point of ground contact, the sole forms an acute angle with the ground. The vertex of the angle is the outside of the foot; the point of contact. When the runner is unshod, the sides of this angle aren’t very long. I represent this as the innermost arc (from the vertex). However, when the runner is shod, the sides of the angle are much longer; this is the outermost arc. Because the arc is much longer when the foot is shod, the inside of the foot will accelerate over a comparatively longer distance (the length of the bigger arc) in order to lay flat on the ground. This means that the overall forces that travel up through the foot and into the leg are that much greater when running in big-soled shoes. There are two important points here: first, the modern running shoe was designed to artificially extend the stride. As the stride extends, the impact forces are greater and greater. This isn’t a problem when the runner’s muscles have developed to extend the stride; most likely they have also developed to absorb and dissipate those increased impact forces. But when the stride is lengthened artificially, the runner hasn’t “earned” the right to interact with those forces—and they’ll get injured. Similarly, the shod foot in particular has no business having a wider sole. By definition, a habitually shod foot is weaker than a habitually unshod foot. 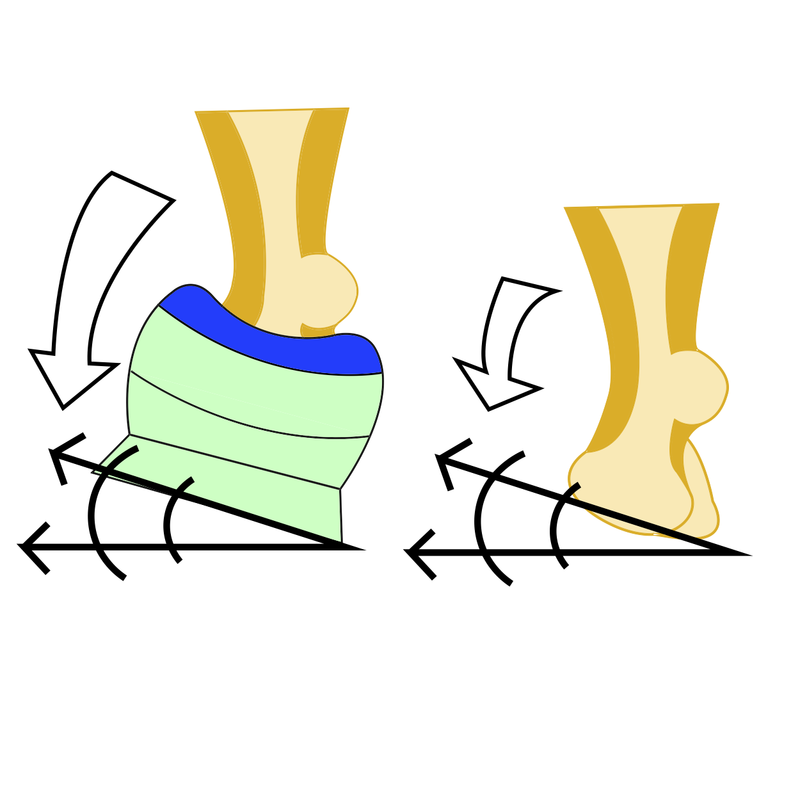 And because the forces created upon landing/supination are much greater when shod than when unshod, the possibility of injury skyrockets: the weakened structure is generating with forces much greater than those which the stronger structure would ever generate. That’s a bit of a problem. But there is a second point to be made here: this analysis is based on simple physics and geometry. And yet, the multibillion-dollar running shoe industry pays very little heed to the physical, biological, and mechanical principles by which the body moves, and by which it grows and develops. Out on the road, halfway into the marathon, the maximalist/minimalist debate doesn’t matter. Out there, you aren’t debating the minimalists. You’re debating physics. You’re debating biology. You’re debating geometry. If the worldview that you approach that debate with doesn’t heed the relevant laws and principles, you’re going to lose. In direct measure to how badly you lose this debate, will be the magnitude of your injuries. Previous Post(Not) running quote of the day.Next PostSystemic paradigms and their repercussions: the athletic phenomenon of “heel-striking,” and its origins in scientific reductionism. Your “analysis” of the biomechanics is not supported by the evidence and is just made up wishful thinking – wishing something is true, does not make it so. You have ignored what the research evidence on impacts is saying. I guess you have to ignore it as it does not support what you claim. Minimalism was a fad; sales of minimalist shoes have now dropped to 3% of the running shoe market. The relatively unknown maximalist running shoe, the super cushioned Hoka One One now outsells the entire minimalist category. In some ultramarathons, up to 2/3rd’s of the competitors are in Hoka’s. There has been no ‘surge’ in injuries with this trend as there was when the minimalism fad started. Almost no one is advocating or touting maximalism (including me) – and an extraordinary number of fan boys, books, websites, etc etc are touting minimalism; yet runners are no longer buying it. There is a reason for that. Runners have voted with their feet. The sale of minimalist running shoes may have waned, but the idea that you need LITTLE, instead of A LOT in order to run safely and effectively (minimalism, in essence), has been going strong for the past million years or so. The point that I was making in this article is that the market (and the consumer) is fickle. People buy stuff that doesn’t promote their health all of the time. For example, people vote with their dollars in favor of the Coca-Cola company, and they do so to their detriment. Coca-Cola outsells so many other products, and yet no amount of sales will make their flagship product be any better for the human body’s longevity. The Hoka One One has only been extremely popular for a year or so. It takes a while to rack up structural damage to bone tissue. We should continue this conversation in a couple of years. Point taken. I should have said that its popularity has only gone viral—to outselling the entire minimalist category—since very recently (a year or so, from what I can remember). I believe that injury trends seen in minimalism were generated largely by the highly irresponsible marketing from Vibram, as well as the reactive movement started by Born to Run. I say this because of all the biomechanics research that supports the idea that the human body has a better time running with less on its feet as opposed to more. Treating a shoe like you treat a medicine pill—as a quick-and-easy solution—is a bad idea. But I suspect that because of marketing campaigns associated with minimalism, a lot of people did exactly that. The question is (and remains) whether the injuries surrounding minimalist shoes are because of irresponsible marketing and naivete in their adoption by runners, and the injuries surrounding maximalism are because of problems with the structural design of shoes (or both, or vice versa). In any case, and I agree with Craig on this, the winner in any situation is the runner who is informed not only about the product, but about themselves.